So these are more of a cross between an Oreo and a moon pie, but they are yummy! After I had my first child my Mom informed me that there was a tradition in our family, Grandpa gives each of the grandchildren an Oreo when they are 8 months old. 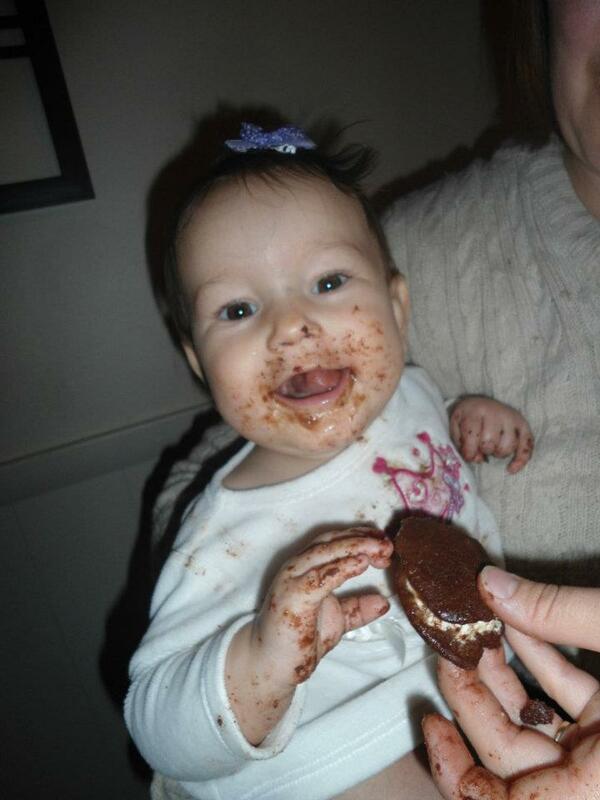 I wouldn’t want to break tradition… so, if my child was going to eat an Oreo, it would have to meet my standards. I knew I would have to make my own… somehow. The resulting cookies were tasty enough for us healthy people, messy enough for Grandpa and healthy enough for me so I think we did pretty well! Although I will admit that Grandpa was a little less than thrilled about it not being a REAL Oreo. My biggest trouble was with the filling, since I have cut shortening out of my diet I needed something else. I decided to use a marshmallow recipe I had found on the internet. 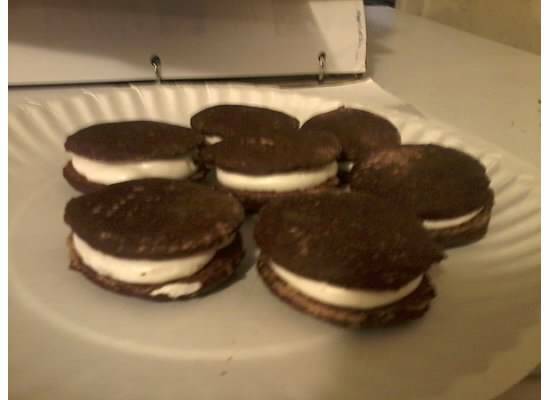 So the final product is an Oreo like sandwich cookie filled with marshmallow fluff. Preheat oven to 325 degrees. Mix dry ingredients together. Blend in remaining ingredients. Knead dough with your hands until it becomes like playdoh (add water a little at a time if needed). Form into 3/4 inch balls, place each ball on a greased cookie sheet and press flat with the bottom of a glass,leaving about 1/2 inch between each cookie. bake 4-6 minutes, or until cookies are crunchy. Remove from cookie sheet and place on cooling racks immediately (if they cool on the pan they are very difficult to get off). Separate cookies into like size pairs, pipe filling onto one side (almost to the edge) place the other side on top, repeat until all pairs are filled and sandwiched together. Mix gelatin into water, microwave about 10 seconds and stir to dissolve gelatin. Put gelatin mixture and agave nectar and remaining ingredients into a bowl. Beat for 10-15 minutes until mixture becomes thick white and fluffy. Put marshmallow fluff into a pastry bag with a wide mouth tip and pipe onto cookie halves. I like to use the pastry bag because I always have leftover marshmallows, I make the remainder into mini marshmallows by piping the excess out onto waxed paper that has been dusted with cornstarch. to do this you place the tip of the bag close to the paper press out a dollop of marshmallow and ease off the pressure as you pull the bag straight up (it will look like a large white chocolate chip). After letting them sit for a while you dust your hands with corn starch, take each marshmallow off the paper, roll it in your hands gently to coat it lightly in corn starch and place it in a baggie. They make a perfect little mini treat! Make sure to rinse your bowls right away because it is really sticky and a lot more difficult to remove after it dries! On a side note, I am not sure that cornstarch is the best ingredient to use as it is not a whole grain but I have not been able to find any alternative and it takes half as much to thicken things than using white flour. For anyone who may want a more traditional Oreo, here is the original filling recipe- if you know of a better alternative for shortening let me know. Combine all ingredients and mix well. form into 1/2 to 3/4 inch balls, place in the center of each sandwich and press until the filling nearly reaches the edge of the cookie. I don’t know that there is any way to make the filling healthier- I will stay with the marshmallows!